Eagle Cleaners handles all alterations, even the little ones, like a quick fix, a hem, or even a missing button. Come see us with your alterations and best of all, basic repairs are free! We do almost your entire closet, caring for them as if they were our own clothes! Business attire: Suits, Dress Shirts Dresses and skirts, Blouses, Tops, Ties, Pants. Outdoor attire: Vests, Coats, Parkas, Winter Accessories. Keep your musicians looking as in-tune as they sound. We offe pitch-perfect cleaning for band uniforms and chorus attire. 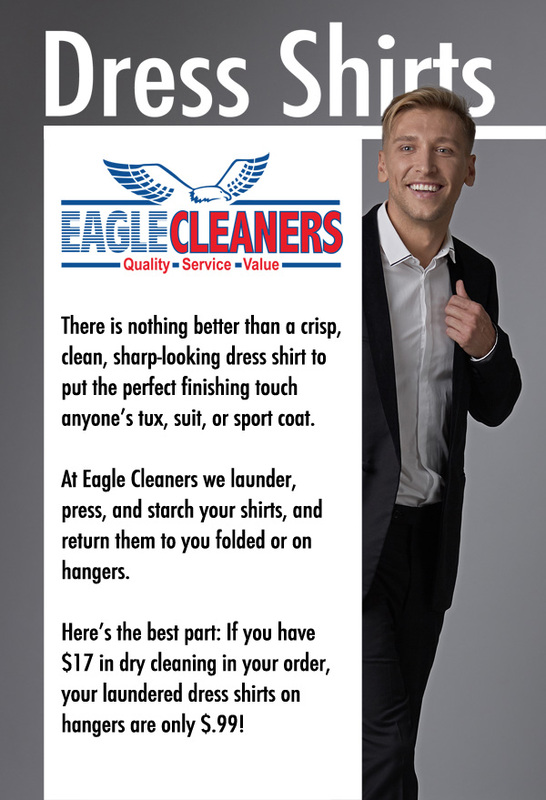 One wouldn’t typically associate household items with drycleaning, but Eagle Cleaners keeps common items like table liners, draperies, comforters, quilts and area rugs crisp and clean. Before you mount up, stop by Eagle Cleaners and our team of local experts will take care of all your riding accessories from blankets to saddle pads to chaps and even leather riding clothing. We care for all your precious leather, suede and furs including coats, dresses, skirts, jackets, etc. We take the utmost care of the things that you can’t wash yourself. Our commercial services include: Ballet Costumes, Band/Choral Uniforms, Theater Costumes and Liturgical Vestments & Altar Linens. We clean them, restore them, and repair them! Eagle Cleaners offers custom men’s and women’s shoe repair for all styles and brands including work boots, dress shoes, high heels, western-style boots, fashion boots, UGGs, suede boots, and more. Our shoe repair craftsmen and shoe cobblers have the experience needed to properly complete recorking shoe soles, leather refurbishment, suede and fabric cleaning, and many other types of shoe repair. There’s no need to throw away your broken shoes when you can count on the expert shoe repair craftsmen at the Eagle Cleaners. Whether you need the fabric of your oxfords cleaned or the leather of your boots refurbished, our team has extensive experience in providing high quality shoe repair services. From Gucci and LouBoutin high heels to Ralph Lauren, our expert shoe repair craftsmen can make any style of shoes look brand new again. The shoe cobblers at Eagle Cleaners re-stitch hundreds of pairs of shoes and boots each year. We can stitch any thread color, stitching style, or thread size you need. We also offer SolePro shoe soles, a special women’s shoe sole, that is thin and stylish to make your shoes look as good as when you bought them. Experience Eagle difference today. Laundry is time-consuming hard work, especially when you’re busy. We do it for you just as well as your mother does – but don’t tell her we said that. Call or stop by for pricing and details. Your wedding day is one of the most important events of your life, so keep the memories alive by preserving your dress. This special cleaning and packaging technique saves the color, fabric and shape of the dress. We also do Baptism Gowns!